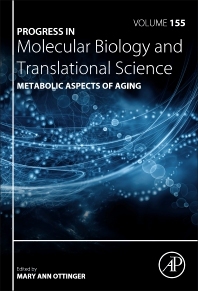 Metabolic Aspects of Aging, Volume 155, the latest release in the Progress in Molecular Biology and Translational Science series seeks to provide the most topical, informative and exciting monographs available on a wide variety of research topics related to prions, viruses, bacteria and eukaryotes. The series includes in-depth knowledge on the molecular, biological aspects of organismal physiology and function, with this release including chapters on Longevity, Metabolic Disease and Community Health, the Metabolic Aspects of Aging, Obesity, Metabolism, and Aging: A Multiscalar Approach, The Intersection of Curandismo and Western Medicine and Their Epidemiological Impact for Aging Mexican Americans, and more. Mary Ann Ottinger is a Professor of Animal and Avian Sciences at University of Maryland, USA.